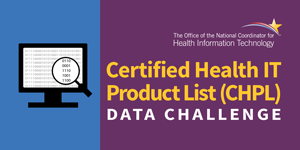 The Office of the National Coordinator for Health Information Technology (ONC) Certified Health IT Product List (CHPL) Data Challenge is a call for developers, researchers, and innovators to develop a software application that makes use of the data in the CHPL application programming interfaces (API) or XML files in novel ways. The application should provide solutions to challenges for health care providers, health care consumers, and the health IT community​. The main purpose of the Antimicrobial Resistance Rapid, Point-of-Need Diagnostic Test’ Challenge is to obtain an awardee(s) that will develop one or more rapid, point-of-care in vitro diagnostic tests that would be of significant clinical and public health utility to combat the development and spread of antibiotic resistant bacteria or diagnostic tests that distinguish between bacterial and viral infections. Prize competitions have a relatively long history in advancing technology. Both governments and private companies have used challenges with prizes to focus technology innovation around a particular problem. The America Creating Opportunities to Meaningfully Promote Excellence in Technology, Education, and Science (COMPETES) Act authorizes investment in innovation through research and development to improve the competitiveness of the United States. CCC holds a GSA Schedule on 541-4G for Challenges and competitions Services. Services provided under contract include challenge development, marketing, judging, and event facilitation.